Sheffield's beloved Supertram network could be axed if transport chiefs fail to convince the government to stump up £230 million to renew the system. South Yorkshire Passenger Transport Executive revealed the tram system could be closed because the current trams are 'coming to the end of their working life' after more than 20 years’ operation and there is not currently any money set aside to rebuild parts of the network or buy new vehicles. 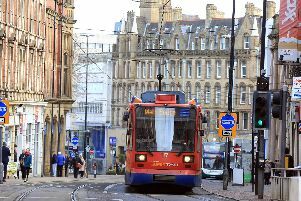 SYPTE is now hoping to raise £230 million from the Department for Transport to allow the tram system to keep running for another 30 years – but warned if the money doesn't come, the trams could become a thing of the past. The transport group has now launched a consultation asking members of the public for their opinions on the future of the trams which will help inform their 'business case' to take to Whitehall. The survey reads: “Whilst ongoing maintenance costs are paid for by the current tram operator (Stagecoach), there is no funding currently in place for the long-term renewal of the system. The survey focuses on three different options:- to replace the trams with buses, maintain the network as it is or to renew and modernise the system. Ongoing operating costs would be lower as there would be “no track or overhead wires to maintain” and the bus upgrade would take about three years to complete. But the document cautions that replacing the network would “undermine the benefits” of the tram-train project between Sheffield Cathedral and Rotherham Parkgate that is due to launch in the coming weeks.